The Boston Women's Workforce Council is a collaboration between the City of Boston under Mayor Martin J. Walsh's administration and Boston University. The Boston Women’s Workforce Council was started in 2013 by former Mayor Thomas M. Menino. The Mayor, who declared 2013 the “Year of the Woman” in his State of the City address, brought together a group of leaders and tasked them with finding a way to better advance women in the workforce. The team concluded that closing the wage gap would not only have the most widespread impact on women in Boston, but also help to decrease the city’s poverty rate, bolster the local economy, and position Boston as a national leader in the workforce. Leveraging these drivers, the Council created the 100% Talent Compact to engage Boston’s local businesses in the campaign to reduce the gender-based wage gap. When Mayor Martin J. Walsh took office in January 2014, he brought with him a vision for advancing women in the City of Boston. 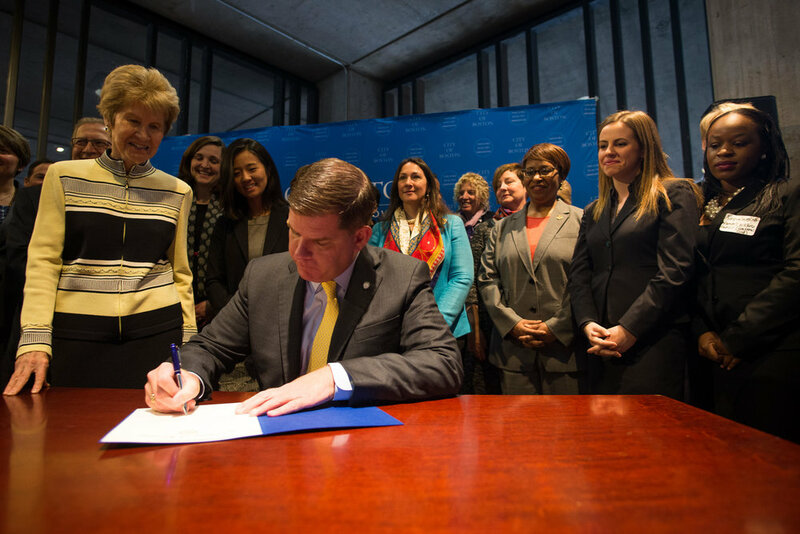 Recognizing that women make up more than 50% of the city’s residents and labor force and are some of the City’s most valuable assets, Mayor Walsh created a new department, the Office of Women’s Advancement, to oversee the full spectrum of issues pertaining to women. A major part of Mayor Walsh’s plan for improving the status of women was to expand the impact and effectiveness of the Council. The bulk of the Council’s work focuses on 100% Talent: The Boston Women’s Compact. The Compact is a first-in-the-nation, public-private partnership in which businesses pledge to take concrete, measurable steps to eliminate the wage gap in their company and to report their progress and employee demographic and salary data anonymously every two years. Over 235 businesses have signed on, including three Fortune 500 companies, with new signers being added regularly. The Council serves as a resource and thought leader on the gender-based wage gap, in addition to other challenges facing women in today’s workforce. Working both one-on-one and in coalition with our signers and other like-minded organizations, the Council aims to raise consciousness about the disparity between women’s and men’s wages and encourage measurable actions toward women’s full and equal participation in the workforce. To learn more about the partnership with Mayor Martin J. Walsh, visit our City of Boston website here. Council Members and Compact Signers met recently to discuss the importance of closing the wage gap.